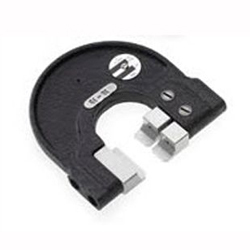 Adjustable limit snap gages provide a quick and easy attribute method of checking outside diameters, groove diameters, or width dimensions by having the go and no go elements set into the snap gage. Thread Check offers 4 assorted frame styles of gages with sizes ranging up to 8 5/8. Larger frame sizes are quoted upon request. 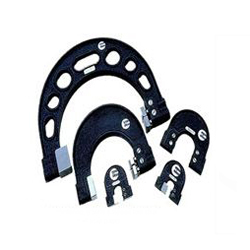 The anvil gaging contacts are adjustable and can be set to various sizes within a range. The anvil gaging surfaces are made of hardened ground and lapped tool steel. Marking discs are supplied on all gages. Thread Check’s standard gages are progressive in design. The workpiece should enter the go limit and stop at the no go limit which is towards the back. Other designs are double ended and single purpose. The snap gage works like a fixed caliper once it has been adjusted and set to a maximum and minimum size limit. To use a snap gage, the upper anvil should be used as a reference point on the workpiece. The gage should be pivoted with the upper anvil acting like a hinge and the lower anvil gaging the workpiece. The plane should be perpendicular to the centerline of the workpiece. The user must be careful not to tip or angle the gage which could create a false measurement. Care should be taken to use gentle force when gaging workpieces. 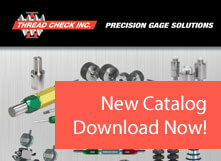 Gauges can be used to gauge workpieces still loaded in a machine or hand held at an inspection area. They can also be mounted in stands so that an inspector can use both hands to manage the workpiece. 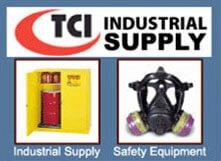 Snap gauges should be checked periodically to ensure that they are still set to the required sizes. They can be calibrated with gage blocks, master discs or with calibration machines such as a Gagemaker Mic Trac. When using gage blocks, stack the prescribed size for the go and the no go limits. To set them properly the no go gage blocks should enter the no go jaws with a slight wringing fit. The same application should be applied to the go side. To adjust them, loosen the locking screws and adjust the anvils with the gage blocks set in between them. Re-check to ensure the gage blocks move through the jaws with a slight wringing fit. Always inspect the gauges prior to setting to ensure the anvils are free of dirt, nicks and burrs. For further assistance with identifying which snap gauge you need, please contact our knowledgeable sales engineering staff. Specifications for Thread Check Adjustable Limit Snap Gauges. Has a one piece rectangular anvil and two adjustable square anvils - all in hardened tool steel. Maximum parallelism error over adjustment range 0.005mm (frame size 00 - 0).